Haha nice one! I reviewed the sort-of sequel Dragon Hunt ages ago. I need to track this one down. Thanks! We loved your review. We are trying to track Dragon Hunt down. Yes! You got it! Anyway, I liked this one, but Dragon Hunt's the better film. While the film's good, it took a little too long to get going, but that's just me. 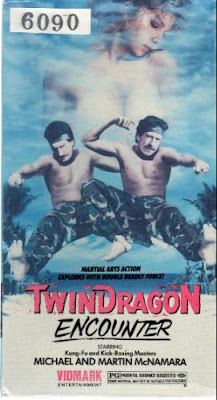 This, along with Dragon Hunt are available on DVD courtesy of the Twin Dragons themselves. Happy you enjoyed it too. This was 79 minutes of silly fun! We are going to purchase Dragon Hunt soon. This sounds amazing. I'm all over it. Wow. Just. Wow. This sounds amazing. The Goodkind: Looking forward to your take on it! The McNamara twins are goofier than two Van Dammes! Videovacuum: Would be interested in your opinion! It is a fun mixture of ridiculous " jungle action" and silly rock anthems. Sounds like a blast! BTW, here's a link to a website you guys might like, they review alot of obscure and lesser known action, thriller and horror films. The site owner also has an auction for lots of VHS and DVDs of the films he's reviewed in case anyone is interested. Thanks for the link, Venom! We appreciate it. Critcononline is a great website! Love all the VHS company scans and reviews. Dude, I'm all over this one. And I think they look like Chuck Norris on the cover. lol. Or is that just me? I've often wondered how much martial arts was going on in Canada. Now I know. RobotGEEK: Thanks! Haha, We agree: they both look like Chuck Norris. Dr. Blacksteed: We are happy your question was finally answered! What are those stupid twins with their goofy chop-socky poses doing covering up the REAL twins on the cover art? This sounds like one of those movies you have to keep in your library for those times when someone needs to believe in the power of cinema. Seriously. What happened to Van Damme week/month? Get on that. Matthew Conway: Haha, good question. I wonder who they are? Sir Phobos: Haha, can't agree more! also: Van Damme month starts next monday. Oh. My. God. I MUST see this! It looks epic! Great review man. Thanks! We are definitely interested in your take on it. It is really goofy. Cheech and Chong meet Bruce Lee. Haha, that makes sense. It is also like a Candadian Deliverance meets Snake Eater. "The twins resemble Frank Zappa and have thick Canadian accents." HAHA! No words. This looks ridiculous and hilarious. But you can't call your movie "Twin Dragon Encounter" and expect anything else. Might have to get drunk and watch this at some point. This movie is a ton of fun and goes well with all beer, wine and spirits! I kept waiting for Godfrey Ho to jump out of the bushes and moon the camera. Haha! That really should have happened!